A beautifully illustrated sticker and colouring-in book from the Moulin Roty ‘il etait une fois’ range. 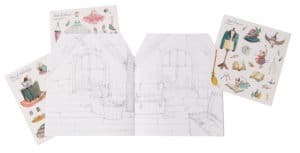 The 10 page book depicts 8 rooms in the house, ready to be coloured and decorated with the 160 stickers provided. Please note that the actual colour of the book may differ slightly to the image as shown, depending on the device being used to view the image.